In this day and age, countless projects are being realized with the help of the popular Kickstarter platform. Whether you want to create a game, a movie, some new technology or simply promote your art, Kickstarter is your go-to platform. One of the many, many creative brains that took a shot is Nicola Piovesan. 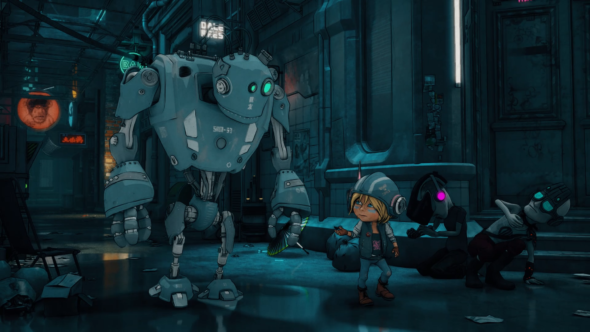 His short Sci-Fi animation movie is called ‘Robot Will Protect You’ and is a spin-off of his award winning short film “Attack of the Cyber Octopuses”. 385 backers decided to help him realize his project and collected a little over 23.000 euros. 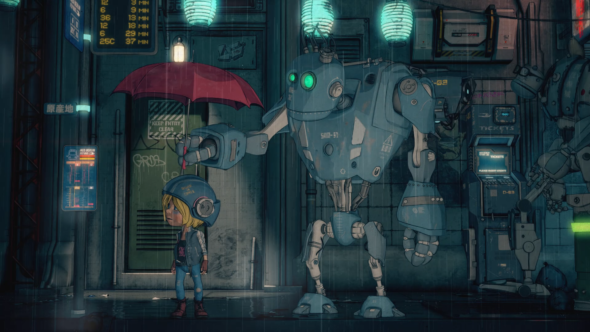 Robot Will Protect You takes place in Neo Berlin (2062), a dark and rainy dystopian world. We follow 9 year old Tina (Lizzie Freeman) and her robot SAM-53 (Richard Epcar). For those who have seen “Attack of the Cyber Octopuses”, Tina will be a familiar face. Cyberspace has become indistinguishable from reality and people get complete emotional satisfaction online. This means they no longer have a need for interaction with other people. Some end up as addicted cyber junkies. Every child that gets born, gets a free robot to protect them. This to encourage people to procreate. Tina feels like there should be more and asks herself if cyberspace has made romantic love obsolete, do we still need love in the real world? The movie lasts about 9 minutes without the credits at the beginning and end. So not a lot of time to tell a story. It feels like more actual story could’ve been implemented in the movie. Now, a lot of images of the city are shown in-between conversations or events. 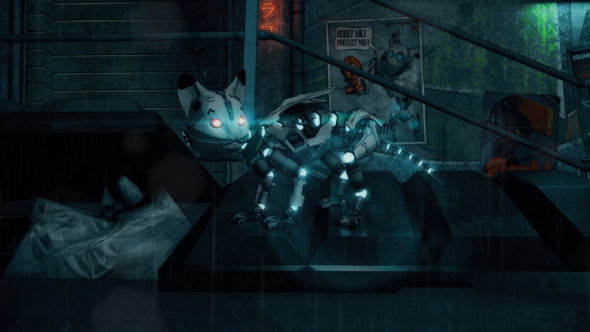 This really shows the toon cyberpunk look the creator was going for, but it takes away the focus of the actual story a little too much. At first, it seems like not a lot of information is given and the story is unfolding rather slowly. It isn’t until the end that you get the double meaning behind the title of the movie. We feel like that buildup towards this ending could’ve been something more. However, the movie succeeds in adding some humour in there, which really contradicts the dark and sad atmosphere that’s omnipresent, giving a lighter touch to the darkness. The best part about this project is probably the artwork. The graphics are beautiful and the characters really come to life. 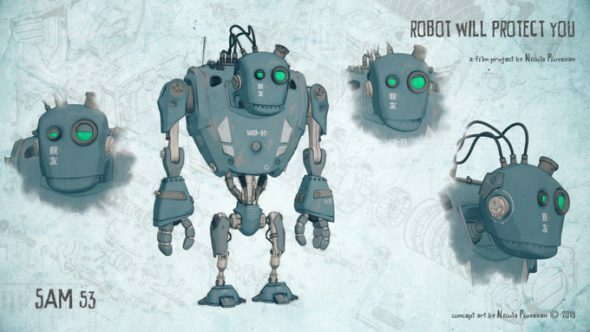 Tina looks like a cute, yet tough little girl and her robot isn’t a typical ‘beautiful robot’, he’s an actual robot. The soundtrack as well as the in-game sounds also deserve a thumbs up. The music that’s used, mostly when surroundings are shown, fits the gloomy atmosphere of the city perfectly. On top of that, it’s really pleasant to listen to. The in-game sounds are your usual suspects; the mechanics of SAM-53 when he’s moving, the rain falling from the sky, etc. It’s all there when it should be. When looking at the voice acting, we have to admit, once again, that they’ve done a great job. Tina is voiced by Lizzie Freeman, who is known from the video game “Secret of Mana” and the series “God Complex”. She does a great job given Tina is the voice of a 9 year old child with a mission. For her robot, SAM-53, voice acting legend Richard Epcar was cast. He has already voiced over 500 characters in games and anime, such as The Joker from the Batman series and Raiden from Mortal Kombat. He also did a terrific job giving SAM-53 the perfect voice. An interesting note is that backers who pledged 175 euros or more had the chance to become a cartoon poster in the movie. They had to send in a picture of themselves and the developers would design a character resembling their look. That cartoon version would then appear in the streets and on the buildings of the film as a poster or LED billboard.